VIZIO has released details behind the its line of High Dynamic Range Ultra HD TVs to support Dolby Vision - the VIZIO Reference Series Ultra HD Full-Array LED Smart TVs - available in 65-inch and 120-inch class screen sizes. 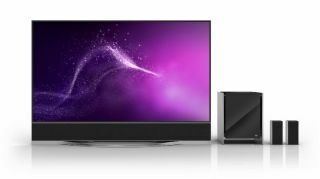 The VIZIO Reference Series is packed with technology. Equipped with Dolby Vision and Ultra-Color Spectrum, the Reference Series displays Ultra HD detail with over eight million pixels in every image. An 800-Nit, Full-Array LED backlight and 384 Active LED Zones create the Ultra HD picture. Several 4K Ultra HD Dolby Vision titles will be available from Warner Bros. streaming through VUDU, Walmart's video-on-demand service for movies and television. When combined with the integrated 5.1 sound bar system on the 65-inch model, home theater aficionados will have an audio experience that delivers a Sound Pressure Level of up to 101dB. The 65-inch Vizio Smart TV with sound bar and accompanying speakers. The 2015 Reference Series was designed for the cinephile. A Full-Array 800-Nit LED backlight enables a wide and dynamic range of luminance with 384 Active LED Zones for contrast control. Clear Action 1800 brings image processing and blazing 240Hz effective refresh rate to the screen. The VM50 Ultra HD engine, a dedicated Ultra HD motion and picture-processing engine, provides enhanced clarity in every Ultra HD image. The Reference Series features an Ultra-Color Spectrum which widens the color gamut, rendering colors closer to the range a human eye can see. This High Dynamic Range solution more accurately reproduces the nuances in every picture, revealing details found in real scenes that are brought to life on the VIZIO References Series. The VIZIO Reference Series also gives consumers access to Ultra HD streaming with an initial slate of Warner Bros. 4K Ultra HD Dolby Vision titles that will be available through VUDU, a leader in quality over-the-top video for digital movies and TV. The content-delivery service will deliver Dolby Vision content in 4K Ultra HD to enable the home cinema experience. Equipped with 802.11ac dual-band WiFi for a fast, efficient streaming experience, the Reference Series features VIZIO Internet Apps Plus, offering entertainment enthusiasts Dolby Vision playback capabilities through VUDU and also instant access to Ultra HD content through other apps including Netflix, Amazon Instant Video, UltraFlix and Toon Goggles. Supported by the HEVC H.265 codec and powered by the VIZIO V6 six-core processor, the Reference Series provides consumers with discovery and organization of apps. For sports, movies or TV shows only available to consumers in 720p and 1080p, the Reference Series is equipped with a Spatial Scaling Engine, which transforms the ordinary pixels to finer, more accurate Ultra HD pixels. The Reference Series supports future ready HDMI ports to ensure consumers using next generation cable and satellite receivers, Blu-ray players and game consoles, won't miss out. The Pure Cinema Engine displays frame rates at an authentic 24 frames per second. Additionally, the Reference Series has a High Velocity Mode that triggers an explosive 120 frames per second for gaming speeds with high responsiveness and low latency.